GALION — With the help of parents, volunteers and a few sponsors, 48 local soon-to be-kindergarteners were able to spend four days learning basic traffic laws and more as the Galion Police Department held its annual Safety Town program at Galion Primary School. 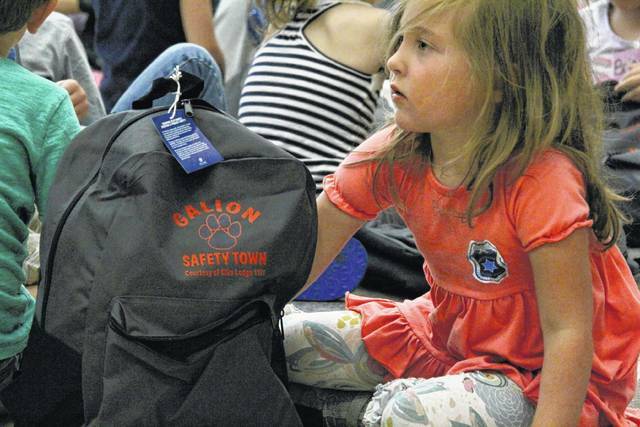 The program resurfaced in Galion three years ago after a 10-year absence with the help of Mayor Tom O’Leary, who had seen its value in the community when his own children participated in Safety Town as they were growing up. Each day was focused on a different area of public safety. Led by Galion Police Chief Brian Saterfield and officer Ralph Burwell, the participants were taught about traffic, crosswalk, and bicycle safety as well as the importance of buckling up their seat belts. Another day was led by Kevin Taylor of CSX Railroad Police and focused on Railroad Crossing safety. Members of the Galion Fire Department spoke to the kids about “Stop, Drop, and Roll” and the Health Department covered the topic of personal hygiene. A graduation ceremony was held Thursday to conclude the program. Parents were invited to attend in the Galion Primary Cafetorium as each child received a certificate and got to shake hands with Chief Saterfield, Mayor O’Leary, as well as “Buckle Bear” and the Galion Tiger mascot. As part of the ceremony, Saterfield announced the appointment of Officer Ralph Burwell as School Resource Officer for Galion City Schools. Burwell replaces, Lynn Sterling who retired from service at the completion of the 2016-2017 school year. The children were gifted a backpack courtesy of the Galion Elks, and given a Child ID Kit thanks to Rite Aid pharmacy. The Elks are also providing backpacks to every incoming kindergarten student this fall at Galion Primary School to ensure each child is prepared for the new school year. Erin Miller | Galion Inquirer Thursday was graduation day for participants at Galion Safety Town. 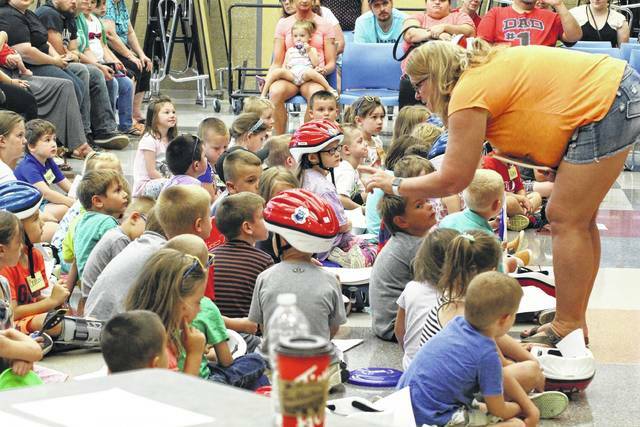 During a ceremony at Galion Primary School, 48 kids finished the four-day course. Erin Miller | Galion Inquirer Volunteer Ronda Altstadt was one of many who helped make Galion’s 2017 Safety Town program a success. https://www.galioninquirer.com/wp-content/uploads/sites/38/2017/07/web1_IMG_6393.jpgErin Miller | Galion Inquirer Thursday was graduation day for participants at Galion Safety Town. During a ceremony at Galion Primary School, 48 kids finished the four-day course. Erin Miller | Galion Inquirer Volunteer Ronda Altstadt was one of many who helped make Galion’s 2017 Safety Town program a success. Contact Erin Miller at emiller@aimmediamidwest.com or 419-468-1117, ext 2049.